It has been in the works for quite a long time–over two years since the initial idea, over one year in the making–but Niall Moody of NDC plugins has released Fragmental, a fairly elaborate multi-effect VST plugin that I commissioned and helped create. Niall did all the difficult stuff, of course, and as such deserves all the credit, but the general concept behind the plugin was mine and I provided feedback/crackpottery along the way. I’ve been using this effect in various forms for the better part of a year. If you’ve ever listened to or joined in any of the IM Noise-Free-for-All Ninjam events we hold monthly (and I’m reasonably sure one is happening tonight), then you’ve heard Fragmental in action, as I tend to use it a good twenty minutes of each event. A little over two years ago Niall made a post on KVR announcing an NDC patronage system (you can read the original post at KVR here), in which user donations to aid in his webhosting fees would result in the development of a custom plugin. I’ve been a big fan of Niall’s work for years, and am also a frequent donor to freeware developers, so I chimed in. This audio file was the start of it all (sorry non-OGG users, it is ogg only, but it was made in one live take so very long ago, not much I can do to change that. Really though, it shouldn’t be too hard to find a player for it, ogg players are legion these days). At the time, I wasn’t so much itching to see a previously unseen audio processor made, I actually just wanted to support Niall’s efforts, figured getting something cool out of it wasn’t a bad idea. The audio clip is a drum loop, played in Audiomulch through a chain of KTGranulator, Spectralmonkeyage and a simple stereo delay. The seed for the idea was the write-up for Soundtoys’ Crystallizer, itself based on a patch from the Eventide H3000. I have never actually heard either to this day, I’ve no idea what it actually does and whether or not Fragmental does similar, but having read the blurb around the time Niall had asked for commissions, something in it sparked the general concept of this effect. I liked the idea of having a granulator, a phase vocoder and a delay mixed into one interface with flexible routing and modulation. The modulation is really the main reason I wanted to see it turned into a single plugin, since that sort of thing (say one mod source for five parameters) becomes messy when using multiple plugins. 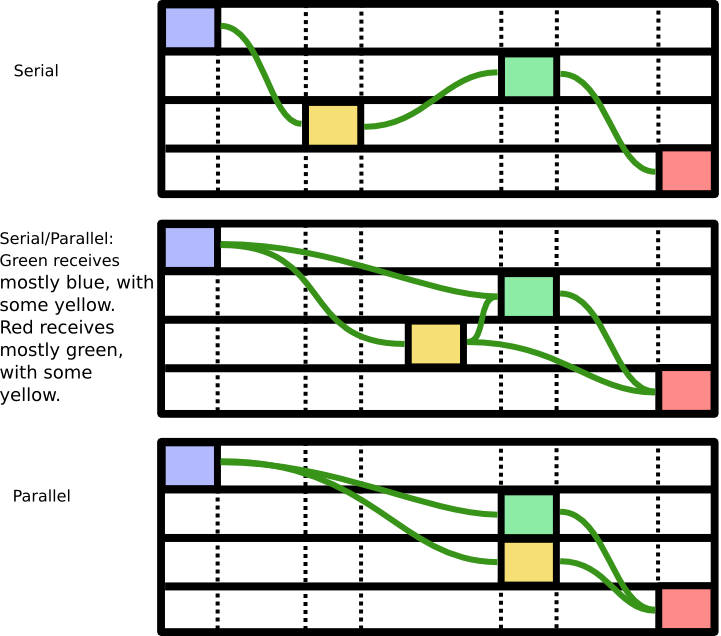 Looking back, what’s most surprising to me is that most of the basic concepts contained in Fragmental are still there: same effects (although the phase vocoder got split in to three separate components, for routing flexibility and due to the use of Richard Dobson’s original pvoc libraries); a global modulation system; and a modular signal flow routing system. Even the overall layout isn’t that far removed from the sketch. Some important changes from this sketch were made along the way. Originally I conceived of modulation being shapes bouncing around an XY axis, with collisions into each other, obstacles and the walls serving as the z-axis. 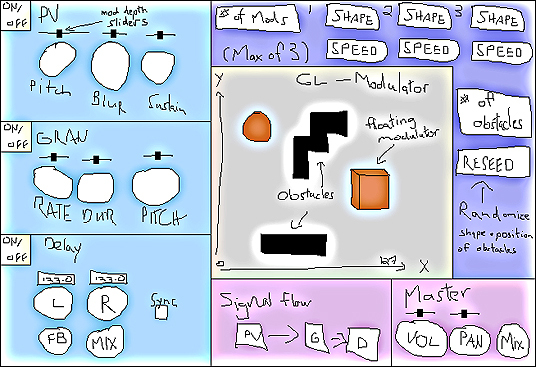 Based on a few ideas we later discussed, and a general desire to not have anything too needlessly elaborate (it would have been, in practice, essentially the same function now contained in the step LFOs anyway, just with the ability to throw stuff around. Check out Audio Damage’s Dr. Device when it comes out in the next few months should you have a hankering to throw modulators around. Its mod system provides all the object throwing you could want, with an excellent filter and delay thrown in the mix), this mod system was axed in favour of what is there now, a step sequencer/LFO/audio rate oscillator, an envelope follower (with a waveshaper later conceived by Niall), and a multi-use knob (with a cool physical drag later conceived by Niall). But I had hoped for something simpler on the whole–simple black lines on white, like a cross between Niall’s Cycleshifter and Sinesynth, with some judicious uses of colour. Which is what we got in the end. 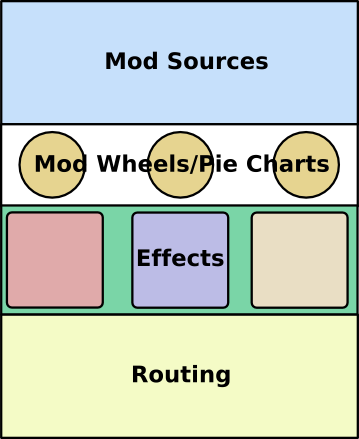 Things were refined to maintain a complex multi-effect accessible from a single pane GUI. The modulators are, however, contained in a tabbed interface, but a) modulator controls are to my mind secondary functions in a performance setting, and being one click away isn’t a big deal, and b) tabbing them keeps the GUI fairly compact. I think that covers most of the ideas contained in the plugin. 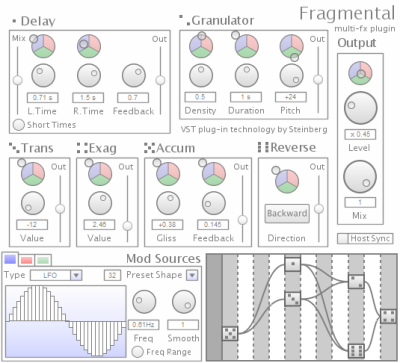 Fragmental is open source, and as Niall has stated, very likely his last VST plugin (there was only one other commissioned effect, MyFirstStepSequencer as requested by spacedad. I think I may have broken Niall along the way, although the end of NDC VST is really more due to Niall’s desire to work within a less restrictive environment than Steinberg’s VST spec for open source projects). I really hope some enterprising programmer picks up on Niall’s interface code and replaces all the existing modules with other kinds of effects. As suggested in its name, Fragmental is about a combination of things that rip audio into tiny pieces (grains, sinusoids, steps, delayed chunks). The design, though, could be easily extended into all sorts of things (say different filters, or distortion effects, and so on). Niall’s routing and mod systems in Fragmental are truly fantastic things to work with, many multi-effect units could benefit from his designs. And there is of course room to improve the efficiency of Fragmental’s design, mostly due to the rather high computational requirements of the pvoc lib (Fragmental has six iterations of the pvoc running at once). I really do hope that of all the open source plugins around (and really there aren’t many) this is the one that will capture the imagination of the community. To further update my great adventures in selling out, Edison Moon is now available for download from eMusic. If you are an eMusic member and didn’t get a chance to get it when it was free or just want to show some support for all that is SIGHUP, you can get it here. It will also be available some time between now and August 5 on iTunes, but last I checked, it was not yet there. Which (my shilling aside) brings me to my point. I created my account with Tunecore and added the record to its system last Sunday, June 10. By Wednesday, June 13, the record was showing on eMusic’s site. Now, I’m sure each service has its detractors, but to my view they have shown exactly how commercial digital distribution services should work. Consider: with Tunecore, you sign up, add content, upload your tracks, configure its distribution and pay for the transaction 100% through their user interface. No waits, no complicated validation process, no mailing of physical copies. And they push content to its distributors so quickly, that, as long the distributor is on top of things (like eMusic appears to be), the content could be available to the public within a matter of days. That’s how it should work, simply because that is obviously exactly how it can work. Further to Tunecore’s credit, they have reasonable fees ($21 to get Edison Moon on iTunes worldwide and eMusic. Considering I’m doing this on a whim, that sits nicely in the “so low, why worry” category for me) and a very non-intrusive user agreement. I’m sure they could do well with more partner distributors (they have more than eMusic and iTunes, those are just the only ones I felt inclined to bother with), nonetheless, they have a fan in me. Following an interesting discussion on Analog Industries and a similar such conversation I had with venerable Intelligent Machinery honcho John Ingram, I’ve decided to go commercial. So as of a few hours ago Edison Moon is now a commercial concern, as will be select future SIGHUP musical works. Likely not all of my output will be commercial, but the bigger projects will be for the foreseeable future. I am doing so as an experiment to simply see what will come of it. I suspect people who have never heard of SIGHUP will have a chance to do so, because commerce has a good way of directing attention, and I might even pick up one or two regular listeners in the end. Maybe. That’s the hypothesis anyway, we’ll see what comes of it. Until now, the only commercially available SIGHUP track was something I did for a benefit compilation for Stillstream radio, available on Blue Water Records (which is a good deal for 17 hours of music, but I’m one of the artists on the compilation and even I haven’t yet found the strength to listen to it in its entirety, so my sympathies to the casual listener. For what it’s worth, I think my track (called “Longplayer”) is one of the best things I’ve done musically to date, ranks somewhere in my top five best things). In the past I had resisted selling music in part on principle. I find commerce and money to be foul creations, and wished to keep music apart from that. But like it matters really, that ship sailed long ago and quite frankly my position was hypocritical as I am well-integrated in this very commercial society we live in. Unless I’m willing to drop out, I think my stance was pointless. And most people in this world just aren’t aware of free music. Perhaps it is a sad statement that selling stuff is the only way to reach most folk, but that’s how it goes, I guess. Besides, it’ll be “free” on the p2p any time now any way, so lovers of not paying need not fret. So there you have it. Look out for SIGHUP to appear on eMusic and iTunes US/Canada/Japan/Australia/Europe on or before August 5, 2007. I’ve gone digital download only for now. I may go with physical copies as well at some point in time, but I’d have to get my head around doing that, so won’t be making steps toward that direction just yet. All other past SIGHUP releases will remain free for time immemorial. Posted: June 10th, 2007 | category: SIGHUP | Comments Off on SIGHUP sells out!